Fives boasts 55 years of experience on the automotive market, making it a proven and up-to-date expert in fluids and circuit filling. Keenly aware of the major challenges faced by OEM parts manufacturers, Fives provides optimized solutions. 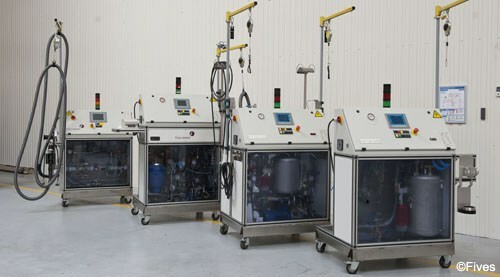 Before filling, all fluids and circuits require special treatments. The quality of the liquid used is one of the key points to guarantee an ultimate quality. Circuits are cleaned and swept with inert dry gas before filling. By controlling the different phases of fluid processing, temperature, water contend, Fives can ensure optimal filling operations. Filling accuracy and productivity are two challenges faced by OEM parts manufacturers. Fives designs equipment capable of high-performance filling: from a few grams to several kilograms within a gram range for accuracy, for production rates of over 360 jobs per hour. Because of the high quantity of parts produced, customers need to fully control final product quality. Fives offers complete management, covering preparation, filling, tightening and testing during production, to guarantee a high level of quality for finished products.